Top Rated 18-Bottle Dual Zone Wine Coolers That You should Go For! BlogHome » Blog » Best Top Rated 18-Bottle Dual Zone Wine Coolers That You should Go For! An avid wine lover is someone who keeps different brands and types of wine reserved in his stock be it office or home. Wine as we say is the ultra-modern way of celebrating occasions and mood because why not? They have this aroma in them to enrich someone’s mood and moreover they taste so divine. People have a hundreds of hobby and one among them is Wine Collection, it might sound weird to some and for those reading this we know you love to collect some. The older the wine, the better it tastes. And, the one who collects wine bottles also knows that they aren’t meant to be stocked in a refrigerator. For wine we have special wine coolers doing the job of preserving the taste and quality of wine. In this article, we are going to talk about the best 18-Bottle Dual Zone Wine Coolers that are available in the market today! While there are plenty of wine coolers in the market who vary from each other owing to some features or size, but when it comes to collecting a good number of wine bottles keeping up with the budget one must go with coolers which have 18 Bottle storing capacity. They are the medium sized coolers. Depending on the types of wine bottles, some should be kept in low temperatures while some are preferred in medium/high temperature. 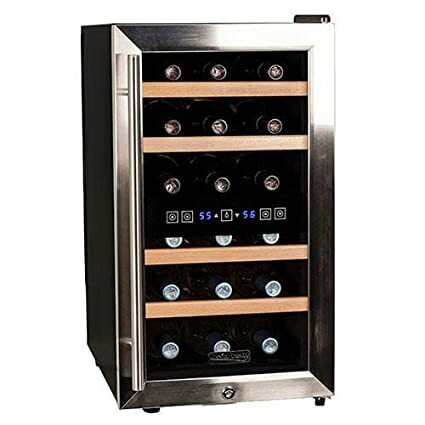 So, you must look for a wine cooler which has dual zone temperature adjusting feature along with a LED display so you know what the current temperature of the cooler is. When you are about to buy a cooler with 18 wine bottle capacity you have to give special importance to the space. If your dining room or kitchen has the space to accommodate a cooler, you can go for a vertical or horizontal design as per the space availability. A wine cooler whose shelves can be pulled out and re-arranged is a great option to accommodate all kinds of wine bottles. Because some bottle might be larger in size and removable shelves make it easy for us to arrange such bottles. When you keep a good collection of wine at your place, you have to maintain its true aroma as well. The Nutrichef Wine Cooler has been specifically designed to preserve the true aroma of 18 bottles of wine at a time. The temperature can be well adjusted by accessing the LED display where there are touch buttons for up so as to increase the temperature and down to decrease the temperature. The cooling system has interior lightings which can be turned on and off whenever the need be. Keeping this wine cooler is like adding elegance to your place, all thanks to the polished racks and exterior black finish of the cooler. The glass door makes the wine cooler look all stylish and sleek. With a 50-litre capacity, it can be well fitted into the kitchen space. It functions quietly owing to the airtight seal of the glass door. If you have a champagne bottle that is too large than normal then chances are that it might not fit into the cooler. We all know that a wine tastes better with age but in order to make sure it undergoes the right aging process, you need the right wine cooler for that. Ivation 18 Bottle Red and White Wine Cooler is a must have as it is known for maintaining consistency of the wines stored in it. This cooler has been designed to keep the Red as well as White Wine to its original form and true taste. Whether you want to store the wine bottles for a long or short time the cooler maintains a stable temperature. Also, you can customize the temperature of the cooler as and when the need be. So, if you look forward to preserve the authentic taste of your wine then you must buy this best seller. This cooler has been closed with Thermopane doors so as to ensure an odor free environment inside of the cooler. It has been built with energy efficient technology and also there is no noise or any sort of vibration coming out of the cooler. Temperature controls while using this cooler hasn’t gone too well with the customers as it should have been. A wine cooler which has stainless steel structure or touch to it defines class and elegance of another level. So, the Kalamera Wine Cooler is here to add a modern touch to the classic cooler. There is also the flush function with a pre-installed cabinetry; it functions as a regular refrigerator does with a compressor which anyway is energy efficient. The Kalamera cooler has come up with Double-Layer Tempered Glass Door and Temperature Memory Function. The compact design and slim structure of the cooler make it all the more accessible. Also, the LED display provides only accurate information and the intuitive touch controls allow the user to easily adjust the settings of the LED Display. The Built-in Cooler is easy to use as the digital control panels define the entire design to perfection. The shelves are ready to use because they can be removed and then put back for upright bottle storage. It is quite expensive as compared to other wine coolers. The Koldfront Wine Cooler keeps up with the original taste of the wine not hampering its quality even by a bit. It is because of the thermoelectric cooling that the upper as well as lower zones function to maintain the quality of the wines with the help of Peltier modules and each of the zones can be adjusted through the control panel which is located in the middle of the cooler door. Also, you can now keep your wine collection completely safe owing to the door lock system. The two temperature zone feature makes this refrigerator as a Free Standing Dual Zone Wine Cooler. The design of this wine cooler is as stylish as it is practical. One can accommodate large bottles and keep up with the wooden polished classy look. The Thermoelectric cooling system always works on energy saving mode and it doesn’t create any vibrating noise. There are no such cons stringed to this product in specific. Even the large bottles can be fitted into the cooler by simply pulling out the shelf to adjust the same. 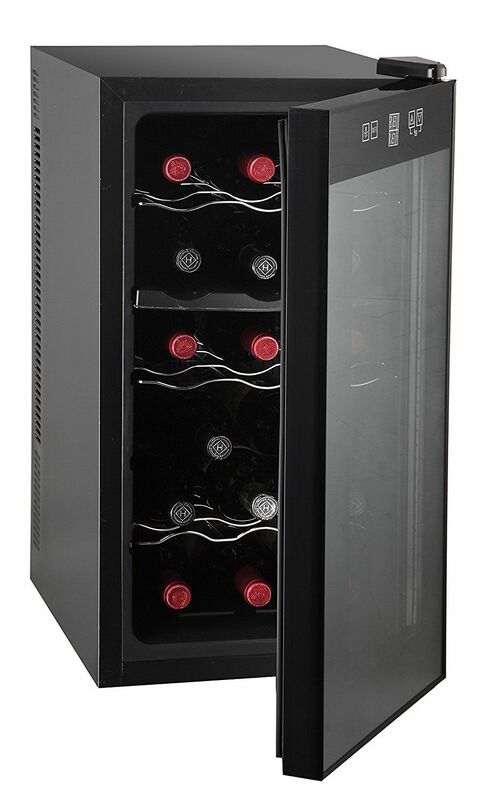 If you are new into this hobby of collecting wine bottles then this NewAir Wine Cooler is the right option for you. Even people who have had this habit of keeping the best of wine collection at their place should update it by buying the NewAir 18 Bottle Thermoelectric Wine Cooler. The Wine Cooler has an efficient cooling system installed which doesn’t make any sort of shaking, vibration or allows the sediments to hamper the authentic taste of the wine. It is easy to navigate this one because the push buttons are easy to use and the LED Display makes it easier to make any changes to the settings. 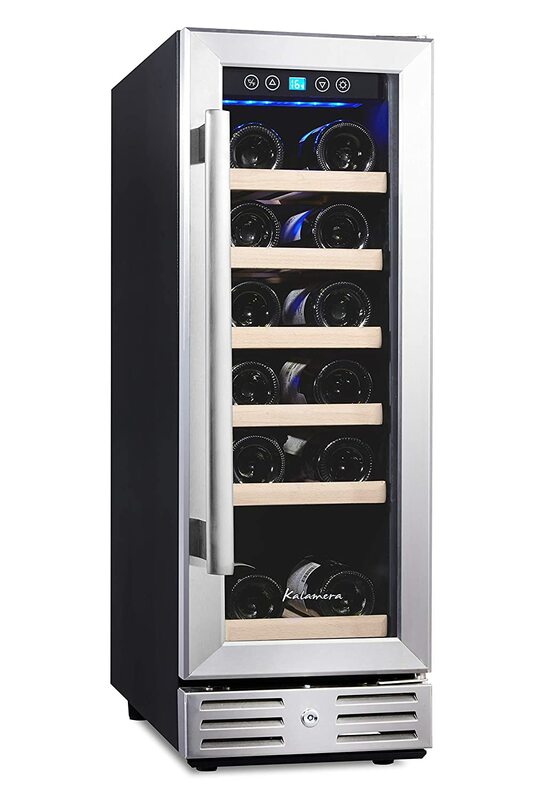 The interiors of this Wine Cooler are adjustable as 5 racks can be removed, re-arranged and re-adjusted as per the size of the wine bottles. The temperature controlling process is very much easy to deal with as you can adjust it as per your convenience. It is a very compact design which doesn’t demand much of space, making it convenient for the user to place it wherever he wants to. It is a total user-friendly package for all types of wine collectors or keepers. The door though requires some good amount of space to open up fully. If you thought that you can preserve your wine bottles like you preserve other drink and beverages of your house by keeping it stocked in a refrigerator then you are completely wrong. If you taste a wine whose bottle was kept in a normal refrigerator after a few days then you might taste an awful taste. The wine gets damaged because of worms and the passage of air that flows in and out since we open a refrigerator in frequent hours for regular use. And, keeping it inside the freezer is just going to damage the true authentic taste of the wine. 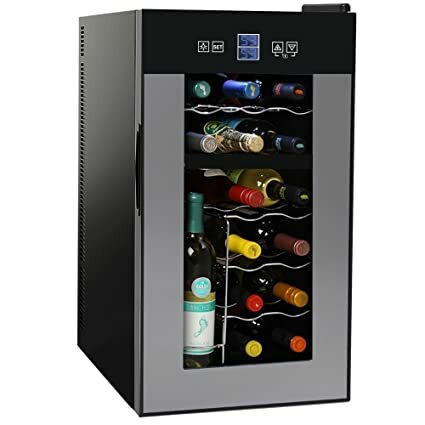 This is the reason why we have found the best-selling 18-Bottle Dual Zone Wine Coolers from amazon.com so as to help people know about their features and how they help. You must buy one after considering each and every aspect as well as keeping in mind the budget.